Palm-size protection. 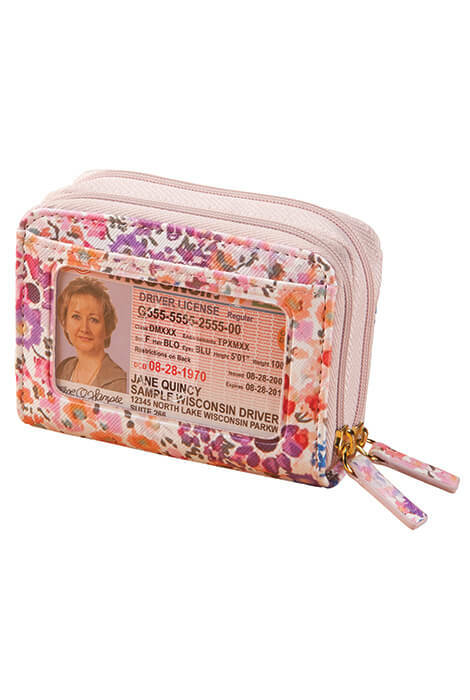 Buxton®RFID floral accordion wallet’s unique aluminum lining blocks RFID scanners to stop thieves from stealing your information. Stay organized with 11 accordion pockets, 2 zip-close compartments and exterior ID window. 4" wide x 3 1/4" high x 1 1/2" deep. Polyurethane. I love this wallet. It carries my credit cards, insurance cards, store loyalty cards, medication list, folding money and a few other items. This replaces the purple version I used for years until it finally wore out. I wish it was a tad bit deeper, maybe a half inch and that it had a section for coins. I have a wrist strap that I snap onto the wallet making it easier to carry when I'm not using a purse. I would buy this product again & again ! Its my everyday wallet and any occasion wallet ! I love this style of accordion wallet. I ordered this floral one to replace my old purple one. 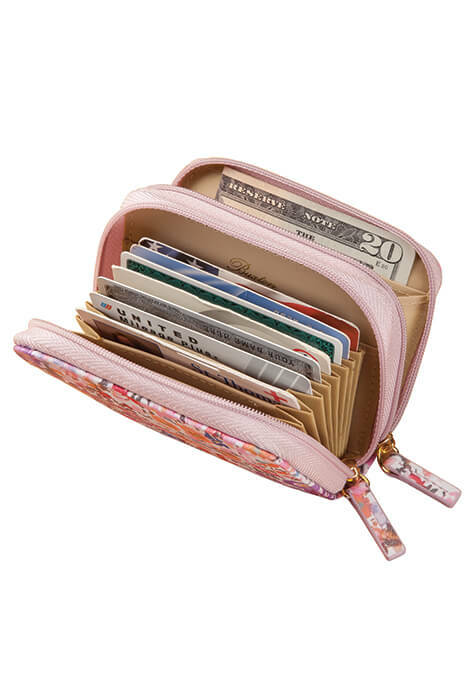 This floral wallet is of another material and tighter. After filling it with my usual credit cards/cash, I cannot zip it closed completely. Hopefully it will eventually stretch. If not, I'll probably buy the purple one again. Also, the floral print is pretty.